Several hours after FIFA announced that North America will host the 2026 World Cup, several prominent Seattleites held a news conference Wednesday to say why it should come here. From Washington State Public Stadium Authority chairman Fred Mendoza, to Sounders owner Adrian Hanauer, to Seattle Mayor Jenny Durkan, to King County Executive Dow Constantine, to Seahawks COO Chuck Arnold – the belief in the room completely drowned out doubt. Of the 17 U.S. cities bidding to host World Cup games, Seattle deserves to be one of the 10 FIFA selects (three cities from Canada and three more from Mexico are already guaranteed to host). It has the resources, it has the scenery, and it has one of the more rabid soccer fan bases in the country. That doesn’t mean local authorities should be complacent over the next two years while FIFA mulls its choices. But short of scoring a political own goal, the biggest sporting event in the world should be headed to the Emerald City in eight years. The acoustically superior CenturyLink Field has built a reputation for the mini earthquakes it produces upon the true “wow” moments in sports. International soccer fans should have the chance to experience that phenomenon. This isn’t bias from someone dismissing the passion of other fan bases around the country. This is testimony from a journalist who has been in dozens of press boxes, but has only felt one rumble (several times) upon a game-changing play. The main concern, of course, is that grass must be installed over the stadium’s artificial turf, which has spawned criticism before. In 2009, FC Barcelona threatened to cancel a match against the Sounders because of what it felt was a subpar grass surface. After his team beat Club America at CenturyLink in 2015, Manchester United manager Louis Van Gaal was so agitated by the temporary grass that he said he would have preferred the turf. Fortunately, nobody complained during Copa America in 2016, when there was much more time to cultivate the grass at CenturyLink. Given the prestige of the World Cup, you better believe this town would go to any length possible to make sure the surface was sufficient – even if it means making the Sounders play on grass in 2025. The landscape of the Pacific Northwest can’t be replicated in any other part of the country. 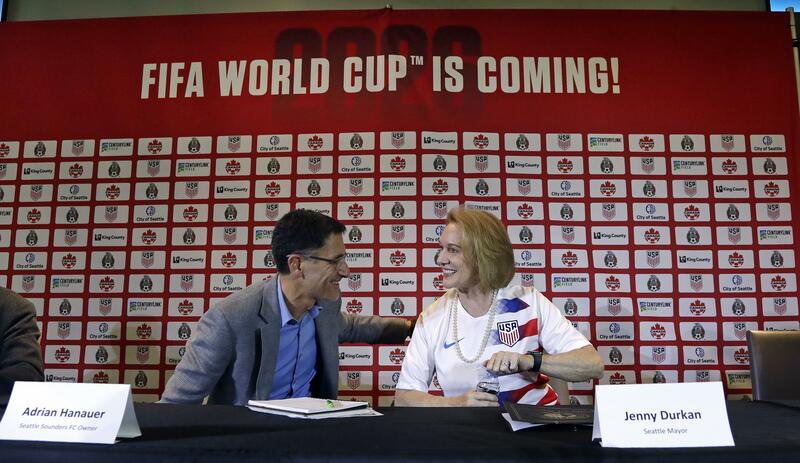 Seeing how Portland and Vancouver each passed up a World Cup bid, Seattle would have the region to itself. If the U.S. wants to show off during the World Cup, which every country that hosts it does, Mount Rainier mixed with the Puget Sound and Seattle skyline is a fool-proof crowd pleaser. That said, the geographical argument against our city is that its isolated nature would make travel on teams and city-hopping fans burdensome. Does anybody want to watch one match in Seattle one day then fly out to Miami? But if this were such an issue for FIFA, why did it choose Manaus as a host city in 2014, when it was more than 1,400 miles from the next closest host city in Brazil? Does anyone really think travelers from Australia or Nigeria or Russia are going to care about flying an extra few hundred miles once they get here? Likely not. The Sounders lead the MLS in home attendance nearly every year, and it’s not just because of the size of CenturyLink Field. After the world’s most prominent soccer matches, Nielsen regularly shows Seattle to be among the country’s most voluminous TV audiences. We also have another fanatical soccer city in Portland 170 miles south, but more than anything, Seattle sports fan recognize the magnitude of the moment. When Kelsey Plum was scorching all of women’s basketball for the Huskies last year, Hec Ed would sell out in support. When the Washington baseball team reached the College World Series over the weekend, it supplanted the Mariners’ hot streak and Earl Thomas’ holdout as the story of the day. Call Seattle fair-weather if you want to, but it shows up when it needs to. For that reason and many more, the World Cup should show up here in ’26. Published: June 14, 2018, 1:29 p.m. Updated: June 14, 2018, 6:45 p.m.